Bushiroad's most recent press release has announced the launch of the Legion Campaign from November 21st to February 28th. Believed to comprise the promo cards that in Japan were distributed as part of the Summer Legion Festival, the Legion Campaign in the west will come in the form of promotional booster packs called "Legion Packs" containing one of six Legion pairs, which will be handed out with every five booster packs purchased from an officially supported card shop. A Legion Pack can also be received with every purchase of a trial deck. The start of the Legion Campaign coincides happily with the five simultaneous releases taking place on November 21st, which will see the introduction of three new trial decks Seeker of Hope, Liberator of the Bluish Flames and Will of the Locked Dragon. As it is customary for cardfighters to buy four copies of a trial deck in order to get a full playset of its exclusive cards, the Legion Packs work well with the community's existing practices, and provide incentives for players to support their local stores rather than turn to Walmart or web dealers. Cardfighters participating in weekly shop tournaments between December 2014 and February 2015 will also receive a Legion Revival promotional card alongside the standard promo packs. While the Legion Campaign is thought to consist of the Summer Legion Festival cards, the Legion Revival is inferred to contain the cards from the Japanese Grade 3 Revival Campaign. The Revival Campaign is an ongoing project to bring back old grade 3 cards from 2011 and 2012 by making them the mates of a new Legion unit with an appropriate skill. So far it includes the Legion pairs Oohirume and CEO Amaterasu for Oracle Think Tank, Droite and Riviere for Bermuda Triangle, Ezer and Alfred for Royal Paladin, and an as-of-yet unrevealed Legion for the Dimension Police's Great Daiyusha. The Legion Campaign can be expected to have the bigger impact; Bushiroad international has specified that six Legion pairs will be available from the packs, suggesting a total set size of 12 cards for the promo pack. The exact contents are speculated to be the Cracking Beast Tamer and Barking Sky Tiger Legion for Pale Moon, the Holy Edge and Overdose Celestials for Angel Feather, Light Saver and Light Blaze Dragon for Royal Paladin, Kuzunoha and Seimei for Murakumo, Researcher Fox and Tester Fox for Great Nature, and Machining Hornet and Tarantula mkII for Megacolony. 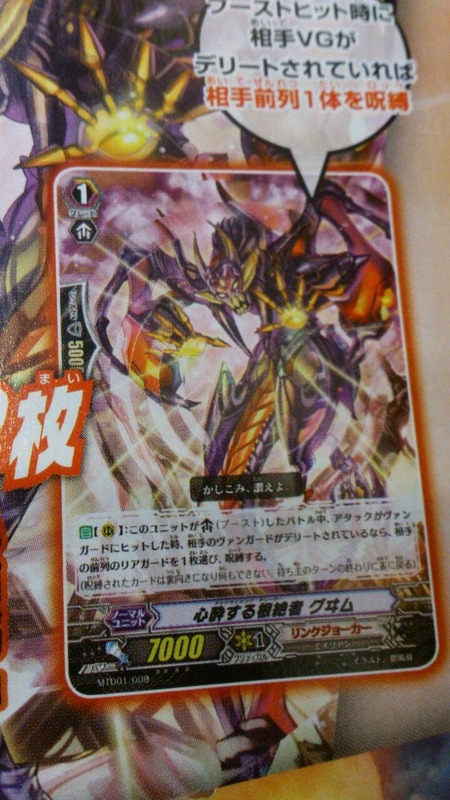 The press release also hinted at the coming of VGE-BT17: Blazing Perdition ver. E for the English-language format, following up on the announcements regarding BT16's consolidating of Japanese booster sets for its English edition. That announcement made waves for revealing that the grade 4 Stride unit Harmonics Messiah will be released as a promo for the set. Like Legion of Dragons & Blades before it, BT17 ver. E will contain cards from multiple sets, but the exact sets included have not been specified. The full press release is posted below. The following is a press release distributed by Bushiroad USA and may not reflect the views or opinions of Cardfight Pro or its editors. 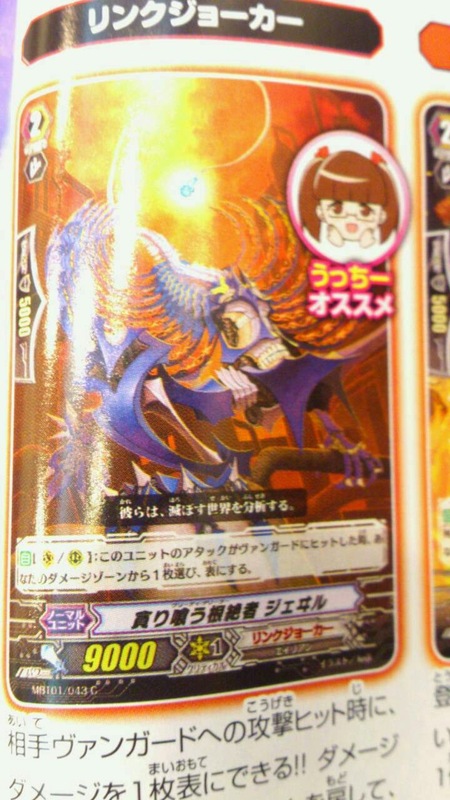 Singapore (September 19, 2014) – Bushiroad revealed that the upcoming Cardfight!! 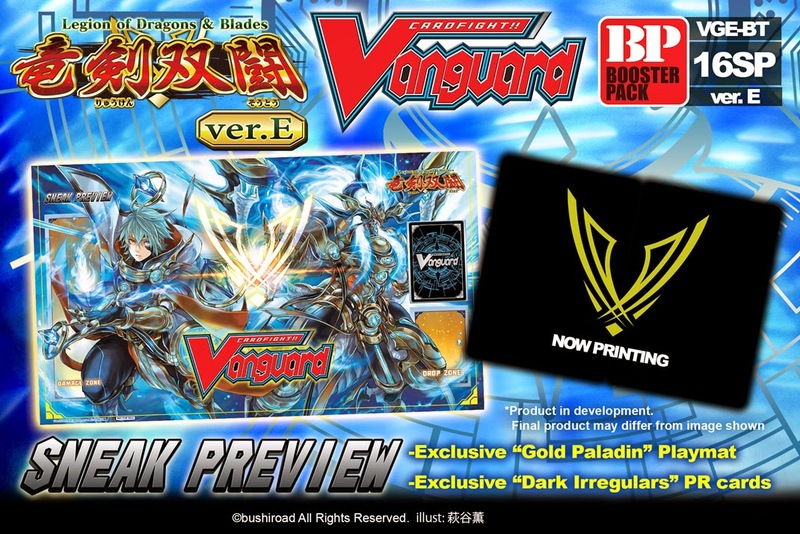 Vanguard English Edition expansion, Booster Pack Vol. 16 ‘Legion of Dragons & Blades’ ver. 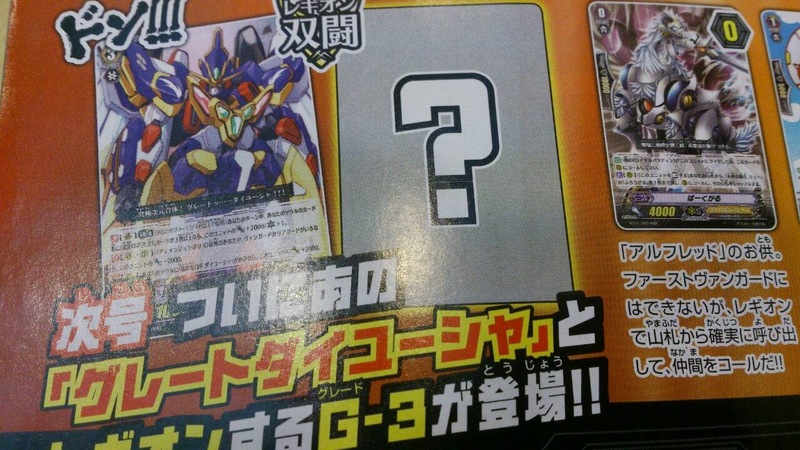 E, contains a mix of cards from 5 different Japanese Edition Cardfight!! Vanguard expansions. ‘ver.E’ is exclusive to the English Edition and features a specially selected collection of cards. This mix of cards allows players access to cards from multiple expansions at once. *Certain cards are omitted from this set. Booster Pack Vol. 16 ‘Legion of Dragons & Blades’ ver. E is slated for release on December 19, 2014. Its Sneak Preview Events will run from December 12 to 14, 2014. Booster Pack Vol. 17 ‘Blazing Perdition’ ver.E is also currently in development and will include a mix of cards from multiple expansions too. Coupled with the year-end releases, Bushiroad announced a ‘Cardfight!! Vanguard Legion Campaign’, which will run from November 21, 2014 to February 28, 2015. This campaign aims to increase awareness of the upcoming Cardfight!! Vanguard Legion Mate arc and to drive sales in official stores. Stores which are not registered with Bushiroad can sign up with Bushiroad as an official store to receive support for this and similar campaigns in future. 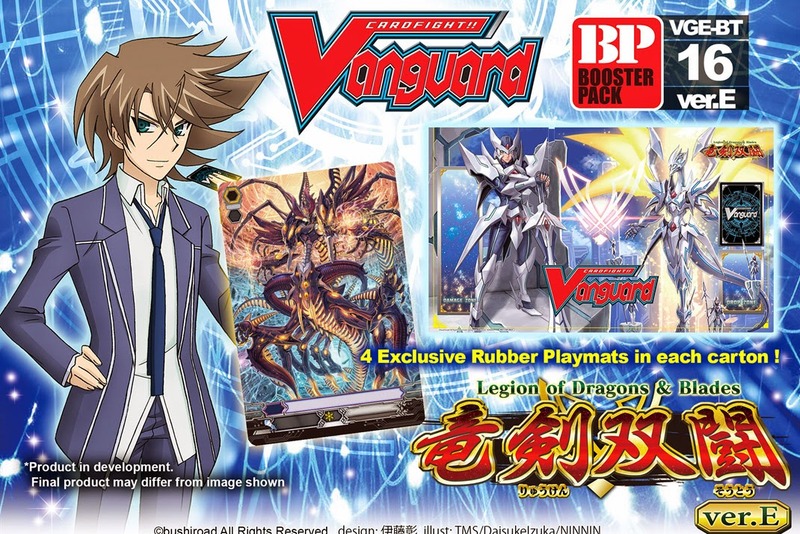 During this campaign, Bushiroad will collaborate with official distributors to provide an exclusive series of promotional pack, named the ‘Legion Pack’, to stores and players. Players who purchase 5 Cardfight!! 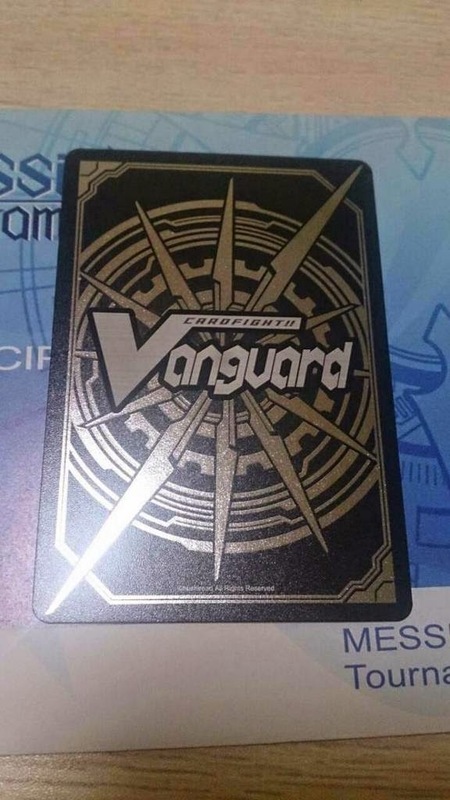 Vanguard packs or a Cardfight!! Vanguard Trial Deck at official stores will receive a Legion Pack. Each Legion Pack contains a pair of ‘Legion’ cards. Players will be able to collect a total of 6 different pairs of Legion during the Legion Campaign. In addition to the Legion Packs, players participating in the monthly tournaments between December 2014 to February 2015 will receive a special ‘Legion Revival’ promotional card together with their regular monthly promotional pack. Following up on the previous announcement from late on the 18th that Harmonics Messiah will be reaching the English format, Bushiroad's international branch has made a continuing statement on the official Cardfight portal and via Facebook, listing the clans available in BT16 ver. E. The English edition set will include support for the Royal Paladin, Gold Paladin, Narukami, Link Joker, Aqua Force and Spike Brothers clans, integrating cards from three of the Japanese booster packs and two trial decks by removing the Neo Nectar, Dimension Police and Nova Grappler cards originally present in BT16: Legion of Dragons & Blades. These cards are presumed to have been moved to later sets. The removal of these three clans was made to accommodate the introduction of BT17, MBT01 and MTD01's Gold Paladin, Link Joker, Aqua Force and Royal Paladin cards as well as additional Narukami units from TD16 and BT17. By removing these clans from the set, room was made for 56 cards in addition to the 42 added into the set size. This brings the total count of cards from other sets to at least 108, making room for almost the entire combined card pool of Malefic Deleter, Neon Messiah, as well as the Gold Paladin, Narukami and Aqua Force units of Blazing Perdition. However, it is unknown which cards from each set will be cut to make room for the accompanying Brawler of Friendship unit. Additional reasons can be inferred from the clans targeted; Nova Grappler has been singled out in the professional community for its infamous Cat Butler Raizer deck, a once-dominant deck from Japanese play that uses the grade 0 Cat Butler to restand its Legioned vanguard. Within the past few months the build was subject to restriction in the Japanese Fighter's Rules. While fears regarding Cat Butler lack foundation compared to the raw unparalleled dominance of Thing Saver Dragon in Japanese play, delaying the hit of Raizers to the English-language format can be seen as a preemptive response to player outcry. Neo Nectar and Dimension Police may have been switched out due to their lack of popularity overseas, as western competition has generally favored Aqua Force's extremely consistent aggressive play style and Link Joker's perceived ability to shut down the game, in comparison to Neo Nectar's demanding strategic buildup and Dimension Police's tendency towards all-or-nothing plays. 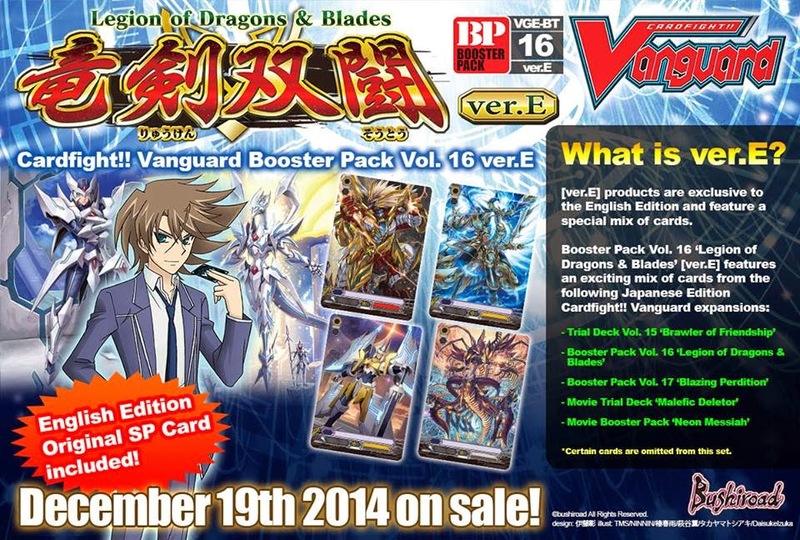 Just hours ago the set release details for VGE-BT16: Legion of Dragons & Blades ver. E came out, making public some of the set's contents and teasing upcoming cards. Unlike standard booster set releases, BT16 ver. E will differ significantly from its Japanese counterpart, already stated in a preceding press release to contain cards from multiple sets. We now know that the English edition set has 42 additional cards over the Japanese edition, totaling 144 cards versus 102. 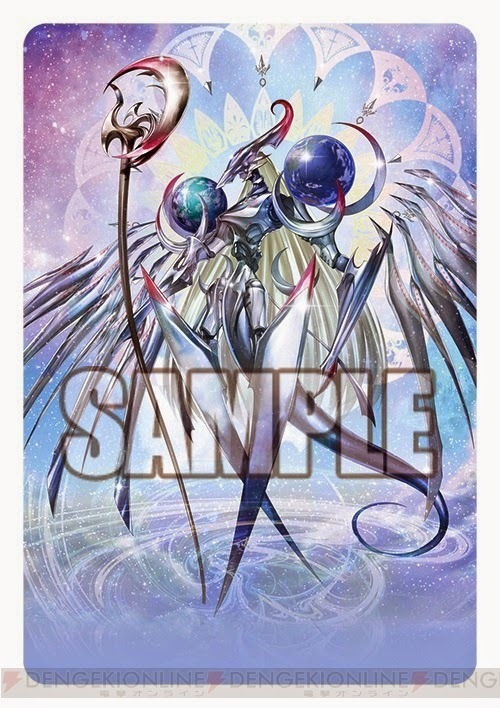 Furthermore, each display for the set will include a promo card, PR/045EN Harmonics Messiah as a box topper, and the set will also contain an original English Edition Special Parallel card. Harmonics is one of the game's most closely kept open secrets at the time of this writing, distributed to those who attend the Neon Messiah animated film in Japan. The grade 4 unit has a unique mechanic "Stride" which currently prevents it from being used as the mechanics of Stride have not been explained and Harmonics' own skills prevent it from being placed in the main deck. The main deck is currently the only deck that Vanguard has, but this fact is imminently about to change. BT16 Ver. E includes adds additional cards in the following rarities; 2 RRRs, 4 RRs, 8 Rs, 28 Cs, 2 SPs and 4 Legion Rares. Based on promotional images the two new Triple Rares are inferred to be MBT01's Bluish Flame Liberator Prominence Glare and MTD01's Daunting Deleter Woksis, and the new RRs would include Prominence Core's Legion Mate Liberator of Destiny Aglovale. The Sneak Preview prerelease event for BT16 ver. E will feature a playmat with Prominence Core and Aglovale's Legion as its artwork, while the set will feature Thing Saver Dragon and Blaster Blade Liberator. 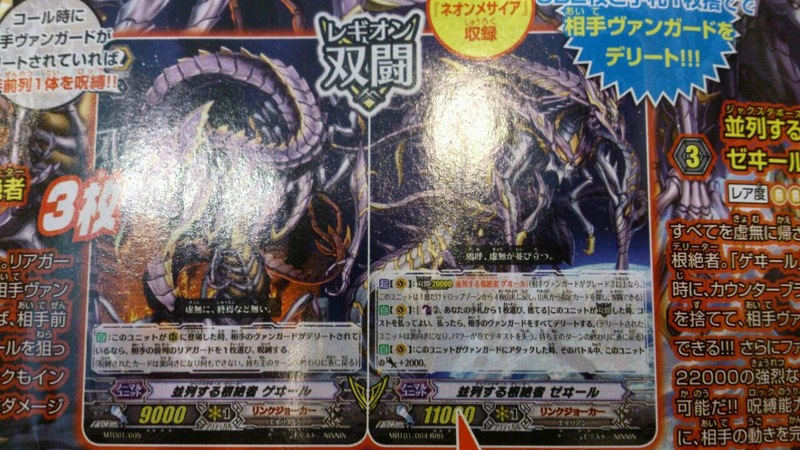 The promotional cards for the prerelease are stated to be Dark Irregulars units, suggesting them to be the Legion pair Psychicers Hadar and Izaya. The increased set size may prove problematic, as each box is still to contain just 30 packs, and the drastically increased size will make it more difficult to acquire a playset of each rarity. The situation recalls English Vanguard's early infamous releases, which added several Rares to BT03, BT06 and BT04. The addition of just two cards to the Eclipse of Illusionary Shadows caused Blaster Dark to become a $16 Rare for a brief time, and even today the card hovers between $6 and $8. 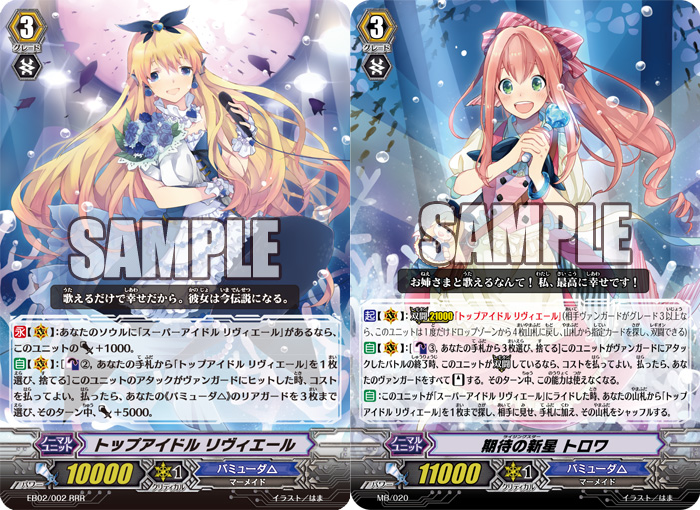 The decision to include Harmonics Messiah in the set was likely done to move the game closer to a simultaneous worldwide release schedule, which Bushiroad has been discussing since Anime Expo 2013. VGE-BT16: Legion of Dragons & Blades ver. E will be released worldwide on December 19th 2014, six days before the Christmas holiday. The set will include 144 types of cards (RRR: 10 / RR: 16 / R: 30 / C: 88) with 14 Special Parallel prints and 6 Legion Rares. Five hours ago images of the Cardfight!! Vanguard Neon Messiah film's promo card were leaked to Twitter by Japanese fans, revealing the full skills of the grade 4 unit Harmonics Messiah. The first unit in the game to make use of the new Stride mechanic, Harmonics uniquely belongs to no clan or nation, possesses a triple drive check instead of twin drive, and has a staggering 16000 base power where 13000 is the norm for grade 4 cards. "Shining on the darkness of chaos, oh grand light of truth----!" CONT: This card belongs to all clans and all nations. Harmonics' skills explicitly prevent it from being placed into the deck, and in fact its card back is completely different from standard card backs. This suggests that Harmonics will remain in a separate zone until Stridden, which has been theorized to be some form of Extra Deck or a zone specifically designed for this type of unit. Interestingly, Harmonics is not a Normal Unit nor a Trigger Unit, but a "G Unit," tying into recent promotional materials for the still-unannounced fifth season of Cardfight!! Vanguard which stated "To the next "G" Stand up!! Vanguard!" The Triple Drive ability gives Harmonics the same offensive trigger checking and card advantage buildup as Great Daikaiser, but the fact that Stride only lasts until the end of the turn suggests that it will either retire or return to the zone it was Stridden from after it is used, preventing Harmonics' 16000 power base from being manipulated as a massive bunker defense. While the exact mechanics of how Stride will work are unclear, seeing as Harmonics can be used by any clan or deck, it serves as an equal upgrade to all of the clans. It can be expected to best support the clans which already have a strong early to midgame but are lacking in some form of endgame skillset, as using Harmonics in place of one's vanguard would mean giving up that vanguard's skills for the duration of the turn. Stride itself exists in place of an Activate, Auto or Continuous skill, and its kanji is written as 超越 Chuuetsu "Transcendence," the same form of Transcendence used in the name of Transcendence Dragon Dragonic Nouvelle Vague. Harmonics Messiah is being distributed as a promo card to attendees of the Neon Messiah film, and will also be printed with alternate artwork as a Special Parallel-rarity card in the accompanying booster set, VG-MBT01: Neon Messiah. Early this morning a fourth trailer for the upcoming film Cardfight!! Vanguard Neon Messiah was put up by the Japanese theater and motion picture company Shochiku Channel. The PV provides a first look at the voice work of seiyuu Miyano Mamoru, who was previously confirmed to be voicing Ibuki. Many of the other leaks from the film's prescreening have been confirmed by the trailer and recent promotional materials, including Kai's new grade 3 Dragonic Overlord the Great, and several of the tournament matchups for the Messiah Scramble. The trailer focuses on the motivations of antagonist Ibuki Kouji, as well as the matchups of the upcoming Messiah Scramble tournament. Ibuki's goal is the total destruction of the Cardfight!! 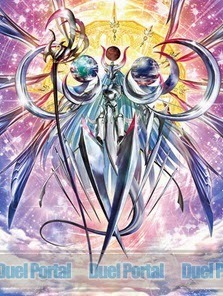 Vanguard trading card game, using his Deleter deck and the awakening of "the Messiah," implied to be the grade 4 Harmonics Messiah. The trailer suggests that this will allow him to erase Cray and the card game with it; while Ibuki's full reasoning is not known, he states that Vanguard "invites calamity and misfortune," painting him to be well-intentioned but unaware that Cray's destruction will also be Earth's. Neon Messiah's fourth PV was fansubtitled and reuploaded to YouTube, and is hosted below. Western demand for the film is strong, but no announcements regarding its international release have been made as of yet. The movie will debut in theaters in Japan this Saturday. The Fighter's Rules for the Japanese format were amended earlier today, modifying a portion of the standard Clan Fight ruleset that has been in place since January 2012; beginning on September 29, Royal Paladin cardfighters may no longer include up to ten Shadow Paladin cards in their decks. Instead, they may only include up to four copies of Blaster Dark. (BD variants "Blaster Dark Spirit," "Blaster Dark Revenger" and "Blaster Dark Revenger “Abyss”" are not acceptable.) The original ruling was made in order to promote the use of Majesty Lord Blaster in clan-restricted formats back when the deck debuted, as MLB is one of the few decks which is designed around mixing clans by using both Royal and Shadow Paladin cards, but of late the ruling has seen mass exploitation as an easy way of building up enough soul for Seeker decks to restand their core boss card, Thing Saver Dragon, twice in a turn. At the head of Thing Saver-“Abyss'” popularity the deck topped in five consecutive tournaments, and at the end of August was used by pro cardfighter Hayashi Hiroki to win the summer 2014 Japanese national championships. This new rule is subject to some criticism, as it prevents Majesty Lord Blaster cardfighters from using other Shadow Paladin cards which support it. Past Majesty decks have made use of Apocalypse Bat and Blaster Javelin from the Shadow Paladin clan, cards which would no longer be permitted under the new ruling. However, Majesty Lord is generally considered irrelevant in the present format when compared to Royal Paladin's modern deck options, so while the principles of the rule may clash with the intent of giving fighters the freedom to play MLB, in practice few will be affected by it. The primary concern is for Seeker cardfighters, who will have to return to playing Sacred Wingal or Brutus as Thing Saver's alternative grade 3. Given the deck's overwhelming success prior to the discovery of “Abyss” however, it is unlikely that pure TSD's stranglehold on the format will be broken. Also pressing is that the Fighter's Rules have changed the behavior of Legion. Originally, a vanguard which entered Legion through card effects (in the case of TSD's superior Legion from the soul, and in the Metalborgs' example of superior riding into a Legion) was still able to activate its Legion effect if it had not already, and return four cards to the deck. While this would not seek the Legion's mate, it would recycle trigger units and cards with the Sentinel skill, and help to prevent decking out in the slower format. The new ruling prevents cards which are already in Legion from activating their Legion altogether, dealing a further blow to TSD. 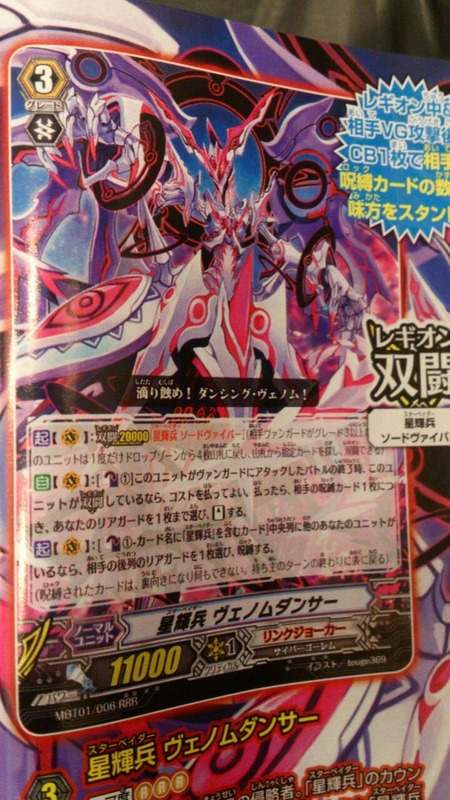 It will be implemented by modifying Legion skill text to state "If this unit is not in Legion, and if your opponent has a grade 3 vanguard..."
This month's issue of Monthly Bushiroad magazine broke early over Thursday in Japan, with several photos leaked onto the net by fans ahead of the issue's release date. The issue's Vanguard section focused on upcoming Link Joker, Royal Paladin, Gold Paladin and Kagerou cards from VG-MBT01: Neon Messiah, to be released in Japan on September 24th. Of primary interest are the new Deleter units introduced to support the cards from MTD01: Malefic Deleter. These new units are each of the Alien race, much like their key card Woksis before them. 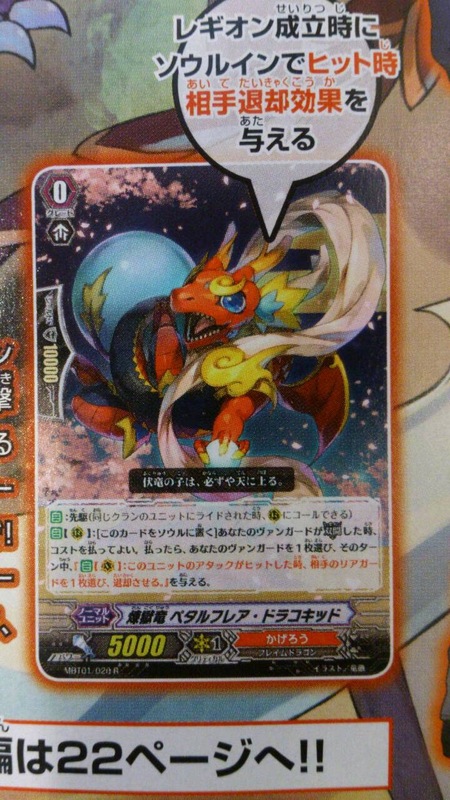 Secondarily the issue focused on Kagerou's new Perdition Dragon support for their remade Dragonic Overlord. 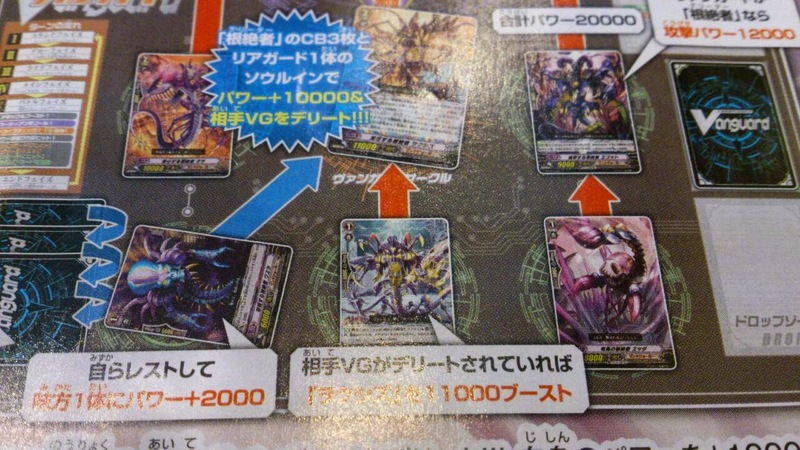 It was also stated that Dimension Police will be the next recipient of a Legion card for the Grade 3 Revival Campaign, with Ultimate Dimensional Robo Great Daiyusha as the mate of the new Legion. Although with his crossride and limit break active Great Daiyusha will be able to contribute an additional +4000 power to the Legion, because the mate's critical is not naturally added to the Legion, his passive second critical will not actually affect how much damage is dealt to the opponent's vanguard. A note on the translation of these cards is that each of the new Deleters employ one of the obsolete katakana ヰ "wi" or ヱ "e," which have not been in use for more than seventy years. Similar to the English "long s" character ſ, these characters have been abandoned in everyday language. The effect they create is that of struggling to read an alien name even when written in a phonetic script. "AUTO: When this unit is placed on a rearguard circle, if your opponents' vanguard is deleted, choose one of your opponent's rearguards, and lock it." Much like the Star-vaders' recent support unit Photon, Gwiil uses an existing condition as a trigger for lock, manipulating the opponent's field for a defensive buff on top of using delete offensively against their vanguard. 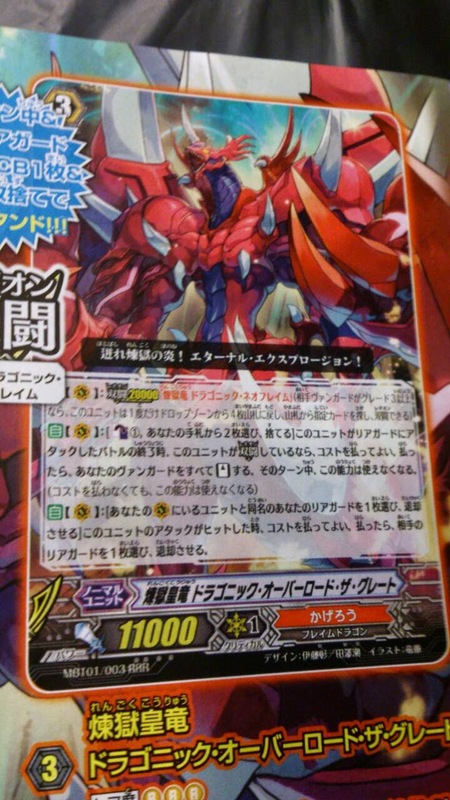 AUTO (Vanguard circle): When this unit attacks a vanguard, during that battle, this unit gets Power +2000." Zwiil's Legion skill, while more restrictive in its timing compared to Woksis, generally supersedes it card-for-card in terms of cost. Zwiil's Legion power boost makes it more effective after delete's period of effect has already expired, and the lower counterblast cost synergizes with their first vanguard Wigor's unflipping skill. The primary weakness of Zwiil is the need to continuously re-Legion across multiple turns to keep delete active, but the overall low impact on counterblast means that Woksis can be kept in hand as a followup to Zwiil late-game. "AUTO (Rearguard circle): When an attack hits a vanguard during the battle that this unit boosts, if the opponent's vanguard is deleted, choose one of your opponent's rear-guards in the frontrow, and lock it. (The locked card is turned face down, and cannot do anything. It turns face up at the end of the owner's turn.)" Gwiim's on-hit puts increased pressure on the opponent to guard the attacks that have already been made more powerful by delete, providing an incentive to drop more cards and endanger themselves to taking important damage later on. "AUTO (Vanguard/Rearguard circle): When this unit's attack hits a vanguard, choose a card from your damage zone, and turn it face-up." Jewir's skill is a notable game changer both for the Deleter and Star-vader subclans, as giving Link Joker a clanwide unflipper has been seen as one of the stepping stones towards breaking the major constraints on their more counterblast-heavy decks. On the other hand, as a Deleter Jewir interferes with the need for Star-vader specific counterblast, and he has better synergy with the Deleters overall because of how the opponent's power reduction from being deleted makes it more difficult to block Jewir in the first place, and so feeds back towards multiple Deletes in a game. Other leaked images have also revealed a new base 8000 power grade 1 for the Deleter subclan, making Link Joker the first clan to receive such a clone. The unit is considered particularly essential for the Deleters because delete's effect of reducing the opponent's power to 0 makes their key number for rearguard lanes 20000. 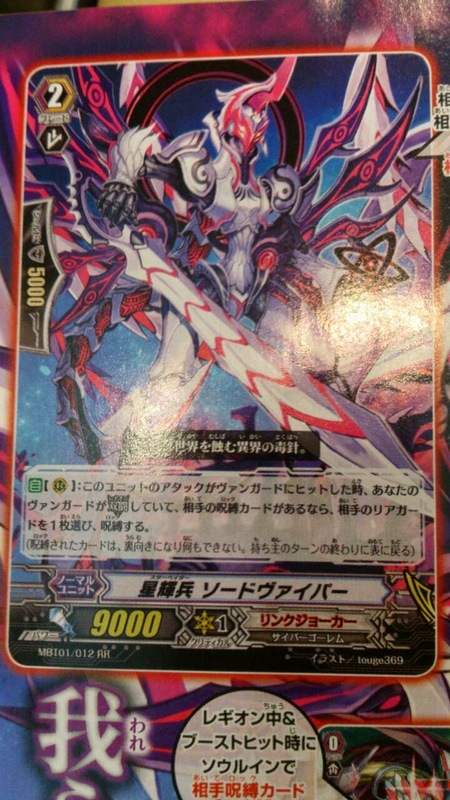 The illustration also reveals a base 10000 power Deleter grade 2, a 12000-power subclan attacker, a Cosmo Roar clone and a special Woksis booster in the same class as Chaos Beat Dragon that gives it an 11000-power boost if the opponent's vanguard is deleted. "AUTO (Rearguard circle): When this unit's attack hits, if your vanguard is in Legion, and if your opponent has a Locked card, choose one of your opponent's rearguards and Lock it." AUTO (Vanguard circle): [Counterblast 1] At the end of the battle that this unit attacked a vanguard, if this unit is in Legion, you may pay the cost, if you do so, for each of your opponent's locked cards choose one of your rearguards and Stand it. 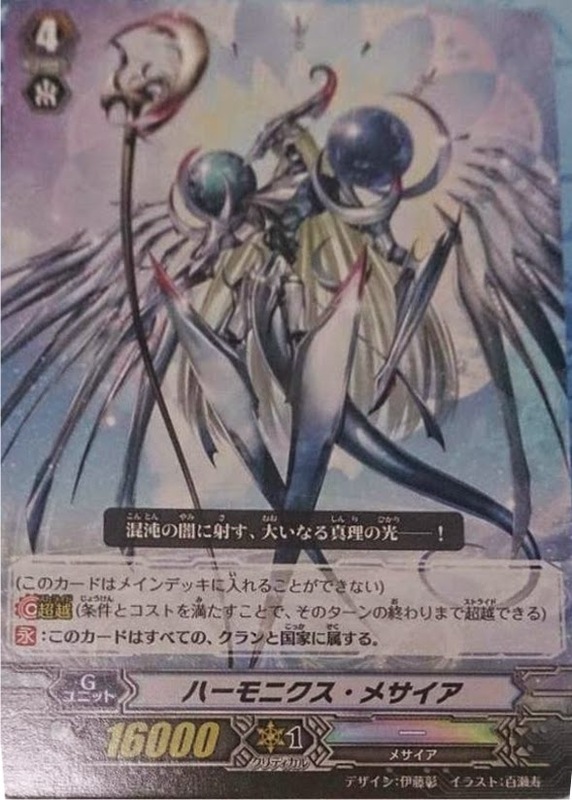 ACT (Vanguard circle): [Counterblast 1 cards with "Star-vader" in their card name] If you have another unit in your center column, choose one of your opponent's backrow rearguards and lock it. "Surge forth Flames of Perdition! Eternal Explosion!" AUTO (Vanguard circle): [Choose 1 of your rearguards with the same name as a unit in your Vanguard circle, retire it] When this unit's attack hits, you can pay the cost. If you do so, choose 1 of your opponent's rearguards, and retire it." "AUTO: When this Unit appears in a Rearguard circle, during this turn, this unit gets "AUTO (Rearguard circle): [Counterblast 1] When a rearguard in the same column as this card is placed in the drop zone, you may pay the cost. If you do so, select 1 of your opponent's rearguards in the same column as this card, and retire it."" The wording on Neoflame is important because unlike Berserk Dragon variants, it does not need to be used the moment the card is called. As long as the conditions are met in the same turn that Neoflame is called, his skill can be used, which gives it synergy with the Great's freedom to attack a rearguard before the vanguard. By using the Great to attack a rearguard in same column from where Neoflame was called, you can use Neoflame's skill to retire than unit's booster when the Great's attack hits, then use Overlord's skill to retire Neoflame and retire a card in the opposite column, after which you can use Overlord's remaining skill to restand. AUTO (Rearguard circle): [Place this unit into your soul] When your vanguard performs Legion, you may pay the cost. If you do so, choose 1 of your vanguards, during this turn, it gains "AUTO (Vanguard circle): When this unit's attack hits, choose 1 of your opponent's rearguards, and retire it."" Petal Flare's skill doubles up on the aforementioned combo, allowing Overlord to retire another unit by hitting, and if his attack connects twice in one turn then using all four units' skills together can result in a total field wipe. Right to left; National Champion Hayashi Hiroki, CEO Takaaki Kidani and National Runner-up Hayashida Kenjun. The results of the most recent Japanese national championships were made public this past week, with Kanazawa cardfighter Hayashi Hiroki being crowned as Japan's summer 2014 National Champion, succeeding Lee Innyeng. The finals took place in Tokyo over August 31st, and were livestreamed onto the Japanese video hosting service NicoNico Douga. NND user Kururun (クルルん) recorded the live broadcast and reuploaded it afterwards, forever preserving the fight. The full ceremony can be viewed in five parts by those with NND accounts here, but the fight by itself has been hosted below for those without accounts. Commentary was handled by TV personality Doctor O, actress Kitta Izumi (voice of Tokura Misaki) and actor Morishima Shuuta (voice of Nitta Shin) while awards were handed out by Bushiroad CEO Takaaki Kidani. Note that while no disrespect is intended, due to their similar surnames, for the sake of clarity Hayashi and Hayashida will hereon be referred to by their given names Hiroki and Kenjun. Hiroki played the familiar Royal Paladin-Shadow Paladin hybrid deck that has come to dominate professional play, Thing Saver-“Abyss.” His opponent was fourteen-year-old Hayashida Kenjun playing Star-vader “Ω” Glendios. Glendios has remained an everpresent element of the format since its introduction in VG-BT15: Infinite Rebirth, and the finals are of particular interest to international cardfighters because the card is just on the verge of being released in thirteen days' time. The video of their fight also has relevance beyond this tournament, as it is one of the few recordings of how Thing Saver-“Abyss” is used in Japanese play. (Hiroki is on the left, Kenjun on right.) 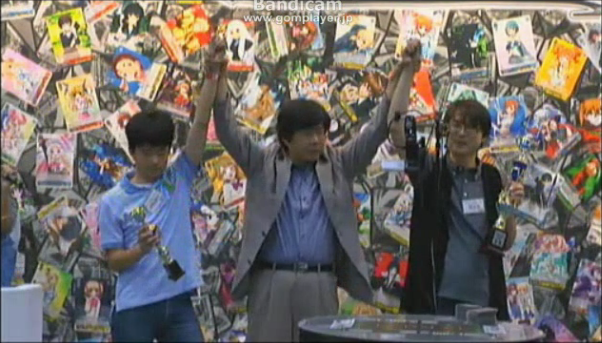 Having won the janken during their pile shuffling and redraw, Kenjun opened the first turn of the game. Each turn up to reaching grade 3, Kenjun used World Line Dragon's skill prior to his ride phase, discarding “Я” units to search for Link Joker cards to ride. This meant that by the time he rode Glendios, Kenjun could already build advantage out of this drop zone with Ruin Magician, which helped compensate for the amount of early guarding he had to do versus Hiroki's Blaster deck. Hiroki had a considerably stronger early game, able to make extra attacks each turn, capitalize on strong trigger checks and search out his copy of Phantom Blaster “Abyss” while Kenjun was restricted by his deck's reliance on running 14 grade 3s and only being able to bring them out one turn at a time. Hiroki's earlier aggression translated to a stronger endgame with Thing Saver, such that instead of being able to grind the game to a halt Kenjun was instead overwhelmed by trying to keep Hiroki's field in check. An important point is that Kenjun was forced to ride one of his two copies of Companion Star-vader Photon early on, and if he had access to a copy of it later then locking both of Hiroki's frontrow rearguards would have made defending through his double restand easier. The turn that Kenjun rode Glendios, he opened the turn at -2 to +1 card advantage; by locking Blaster Dark with Vowing Saber “Я,” then using Colony Maker to play off of that lock and call out Ruin Magician from the deck, and then adding Hyakki Vogue “Я” back to hand with Magician's skill, Kenjun was able to immediately close the gap and tie the advantage +0 to +0. But while this enabled him to keep a stable circulation of “Яeverse” cards in play to maintain locks with, it did not make up for the existing gap in damage. Hiroki was careful to keep Kenjun out of being able to start a chain of omega locks before he could prep his legion properly, attacking Vowing Saber rather than the vanguard at 07:26 to avoid giving Kenjun limit break too early. Moreover, getting Vowing Saber into the drop zone prevented a potential Ruin Magician play to recover both Cocytus “Я” and a theoretical discard for omega lock, which limited Kenjun's midgame advantage plays. Kenjun's decision to lock Mackart rather than Blaster Dark in turn kept Hiroki from superior calling off of his legion, and from abusing Mackart to call and deck thin during Thing Saver's on-stand Legions. 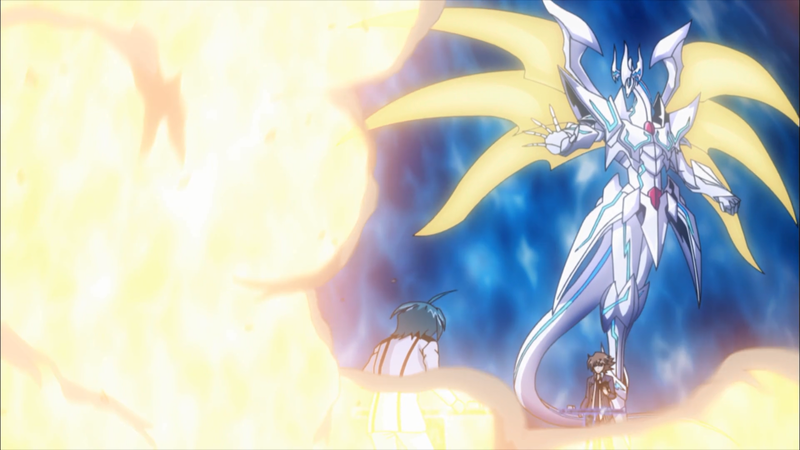 Hiroki's decision to go ahead with his Legion was made with the full knowledge that he would be taking advantage of “Abyss” exclusively for restanding Thing Saver; at 12:40 when he finally rides Thing Saver Dragon he has exactly 5 soul, which is just enough to use Thing Saver's skill twice. The soulblast 3 requirement, along with the previous Thing Saver remaining in the soul, ensured this. Many decks could not come back from the position Hiroki was in at the time, -9 to -4, but the neutral exchange off of his restand and access to a remaining rearguard column to receive trigger checks while being able to make three sequential attacks with his vanguard helped to overwhelm Kenjun's defenses and destroy his remaining resources in the long term, even though the game was not won on that turn. Note that around the 15 minute mark Hiroki could have theoretically won early; Kenjun did not have the resources to guard both Blaster Blade Spirit and all of Thing Saver's attacks, and declared no-guard while at four damage. This turn ended at -7 to -8 after Hiroki's draw trigger and Mackart unlocking, a complete recovery into a positive position. There are several points which could have evened out the fight. One of Glendios' primary advantages versus TSD-“Abyss” in this format is its access to Taboo Star-vader Rubidium, whose on-guard skill would have allowed Kenjun to change the target of Thing Saver's attack to a “Яeverse” unit on the field. Because Thing Saver can only restand after attacking a vanguard, this could have completely shut down Hiroki's decisive turn. However, the play is dependent on having Rubidium in hand, and the only copy Kenjun drew in the game was the one that he rode on the first turn. More to the point, Hiroki's game would have been slowed considerably if Kenjun had allocated the 15000 shield he dropped on Hiroki's grade 2 turn to the vanguard instead of the rearguard. This would have prevented Hiroki from searching out “Abyss,” forcing him to ride Thing Saver on his grade 3 turn, and slowed the buildup of soul by another turn--potentially preventing him from initiating the double restand maneuver entirely, although the full outcome of the fight cannot be predicted because preventing the search and shuffle off of Wingal Brave would completely change how it flowed. While Thing Saver-“Abyss” and Glendios have been cemented as the key offensive and defensive decks of this era, fourth place in the national finals went to the format's unsung hero, Big Bang Knuckle Buster. 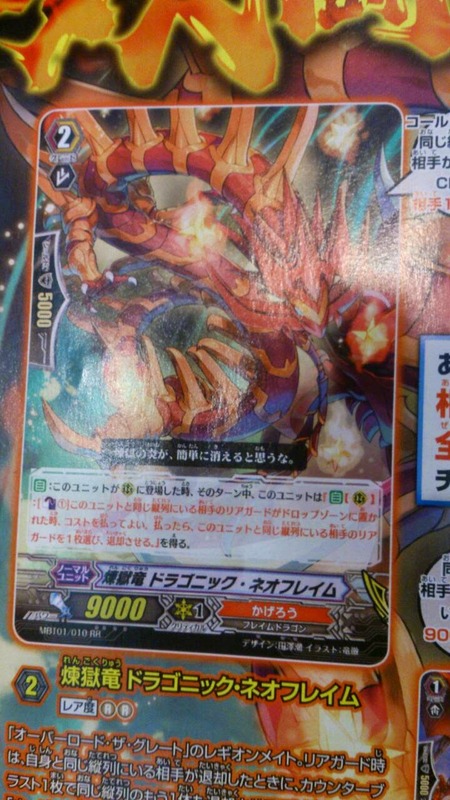 A crossride of Big Bang Knuckle Dragon, Knuckle Buster has been championed as one of the most effective field control decks; his on-attack skill sends a Big Bang card from the hand to the soul while in Legion to battle four separate units. Accounting for the late game defense necessary to protect the vanguard, this typically translates to a -6 overall, but also falls afoul of Glendios' defensive capabilities because the aforementioned Rubidium can change all of Knuckle Buster's targets to a single “Я” unit. The increased prevalence of Quintet Walls and fighters' increasing awareness of being able to guard units separately with what a Quintet Wall calls has also diminished Knuckle Buster's impact. So while highly effective at devastating the opponent's field in most scenarios, the deck's progress has been stymied by the format's defensive options. The contestants notably did not display the kind of strict fight manners Bushiroad has become infamous for in the west. While there are countless horror stories told over American judges handing out game losses for not placing drive checked cards in the trigger zone, Hiroki and Kenjun both fell back on the commonplace habit of drive checking onto the fight table. In a recent press release, Bushiroad has announced its modified schedule for 2014. Key announcements are the simultaneous release of five products on November 21st, as well as the announcement of the new booster set, BT16 ver. E: Legion of Dragons and Blades. Although billed as an English edition of BT16, ver. E's contents will significantly differ from its Japanese counterpart, including "cards from multiple sets." Scheduled to be released on December 19th, with prerelease events from the 12th through the 14th, ver. E's modification was likely made with respect to the November schedule omitting TD15: Brawler of Friendship. Based on the delay of Narukami's newest trial deck, the predominant theory at this time is that BT16 Ver. 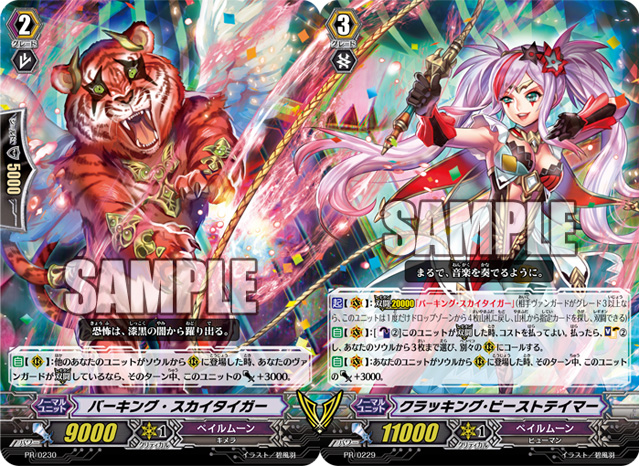 E will drop its Narukami support in favor of a merger with some of the cards from the upcoming Japanese Movie Booster Set, MBT01: Neon Messiah. Following this theory, ver. E would contain the Royal and Gold Paladin cards from MBT01 in place of its Narukami units, which would instead be shifted into a later set. The current delay of BT16, previously scheduled to take place prior to Fighter's Collection 2014, was likely made to accommodate the mass November release schedule. Much like the multi-set mixup of 2012, the modified schedule will have an intense effect on professional play for the English-language game. The initial delay of BT16 pushes back the two decks popularly held to be the best in the Legion format, Thing Saver Dragon and Cat Butler Raizers, while also giving more opportunity for Genesis and Shadow Paladin cardfighters to build up a presence in tournament play using the new extra booster sets. The full press release is hosted below. Singapore (September 4, 2014) – Bushiroad announced the simultaneous release of 5 Cardfight!! 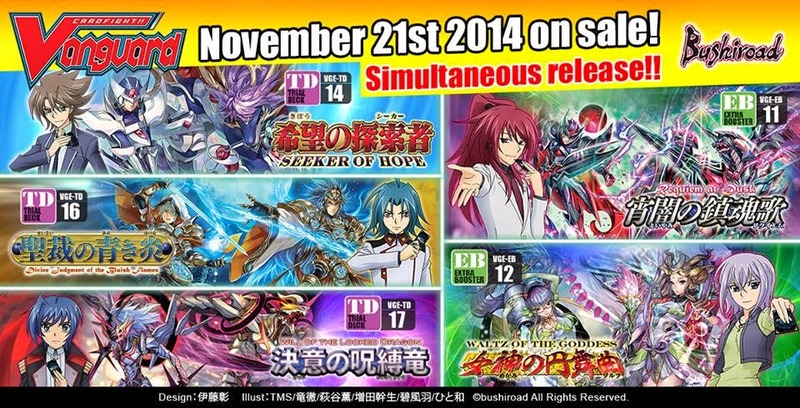 Vanguard English Edition expansions which will be on sale from November 21, 2014. These expansions include 3 Trial Decks and 2 Extra Booster Packs, in addition to the previously announced special Fighters Collection 2014 expansion set. Trial Deck Vol. 14 ‘Seeker of Hope’, Trial Deck Vol. 16 ‘Divine Judgment of the Bluish Flames’ and Trial Deck Vol. 17 ‘Will of the Locked Dragon’ will be released on the same date as Extra Booster Pack Vol. 11 ‘Requiem at Dusk’ and Extra Booster Pack Vol. 12 ‘Waltz of the Goddess’. Bushiroad also announced plans to release an English Edition exclusive expansion which will include cards from multiple sets. This English Edition exclusive expansion, Booster Pack Vol. 16 ver. E ‘Legion of Dragons & Blades’, is scheduled to release in December 19, 2014. The Sneak Preview Events will run from December 12 to 14, 2014. Trial Deck Vol. 14 ‘Seeker of Hope’ and Trial Deck Vol. 16 ‘Divine Judgment of the Bluish Flames’ features units from the ever-popular <<Royal Paladin>> and <<Gold Paladin>> clan. Trial Deck Vol. 17 ‘Will of the Locked Dragon’ will contain the quintessential nemesis <<Link Joker>> units. <<Shadow Paladin>> and <<Genesis>> units will make a comeback with the all-new ‘Legion’ ability in Extra Booster Pack Vol. 11 ‘Requiem at Dusk’ and Extra Booster Pack Vol. 12 ‘Waltz of the Goddess’ respectively.